Jennifer Workman, M.S., R.D., C.Y.T. Providing high quality therapeutic services to enhance, supplement and maintain health and wellness. 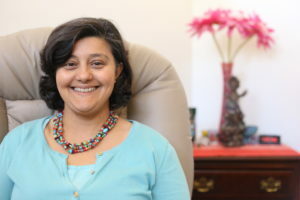 Nita Desai M.D., is a Medical Doctor in Integrative Medicine and is the owner of East-West Integrated Medicine. She is a Certified Ayurvedic Practitioner and has studied Yoga, Western Nutrition and Complementary/Functional Medicine. With over 15 years in private practice, Dr. Desai established East-West Integrated Medicine to provide the benefits of natural and alternative therapeutic practices, state-of-the-art technology and medical science–all under one roof. Please see below to read more about the services we provide. Dr. Desai sees patients Mondays, Wednesdays & Thursdays 9AM-5PM.